Does your little one have high hopes of being a western hero one day? Well, we believe in him! Although, before he can go out and stop outlaws from attacking trains and robbing banks, you'll want to make sure he is dressed up to play the part of the most feared lawman in all of the Wild West! For now, forget about a pristine pair of pistols and don't worry about grabbing a daunting duster. First, you'll want to start with the perfect hat. This Brown Cowboy Hat will be the perfect symbol of justice for your kiddo to sport whilst cleaning up the streets of his town. With a sheriff badge right in the dead center of the hat, everyone will know who runs this town. Your youngster will be a beacon of order that shines through the chaos of the Old West! No bandits will want to stick around once they see your cowpoke closing in from the horizon. 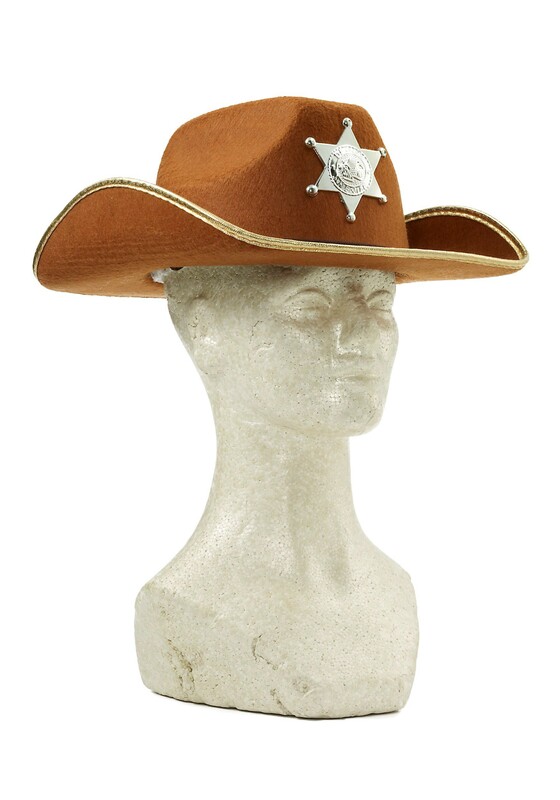 So if you think your kiddo is ready to take on the heavy responsibilities of a lawman, finish his western themed costume with this Sheriff's Cowboy Hat!